VOLUNTEERS AT APOLLO House in Dublin city are busy preparing for Christmas Day. The building is currently being occupied by a group of activists under the banners of the Home Sweet Home coalition and the Irish Housing Network (IHN). On Wednesday, High Court judge Justice Paul Gilligan granted an injunction to the receivers of the building – Mazars – to regain possession of the property. He ordered occupants of the building to vacate the former office block by noon on 11 January. Speaking to TheJournal.ie today, organsiers wouldn’t rule out going to court again before that date in an attempt to overturn the decision. Ogle said some people would love to see the movement fail, but the fact 40 homeless residents at Apollo House have been offered 24-hour beds for six months by the Peter McVerry Trust is a sign the occupation is working. Ogle said the organisers remain in communication with Housing Minister Simon Coveney. Yesterday, the minister said there were 54 unoccupied beds in Dublin city the previous night. “It’s important to let people know that we are significantly increasing beds and services to vulnerable homeless people,” Coveney said in a separate tweet. Ogle said 5,000 litres of oil were delivered to Apollo House three days ago and more will be delivered next week, to make sure the property is warm for residents. 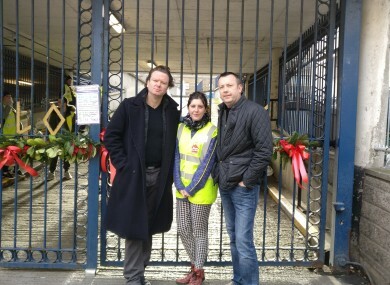 Actor and director Terry McMahon said the idea for the occupation, which has been backed by a number of celebrities including Glen Hansard and Hozier, came about through conversations he had with Dean Scurry, John Connors, Maverick Sabre and Damien Dempsey when they were mentoring men in Ballymun earlier this year. It was in the process of realising that, as mentors, is it arrogant beyond measure to consider yourself a mentor when in actuality you are a coward in your own generation? McMahon said they wanted to make a gesture that would help homeless people and also “give people a collective sense of hope”. Rosi Leonard of the IHN added that she’s heard of people starting to occupy vacant buildings in other parts of the country. “We’ve had people coming up from Cork saying they’re sick of empty buildings. We can’t speak for other people’s anger. Everyone is pretty furious about the situation and that’s why we’re seeing so much public support. It’s absolutely phenomenal. Leonard added that, whether or not Apollo House is vacated by 11 January, the homelessness crisis nor the public anger about it will end. She said she thinks the initiative will grow into “a very powerful national movement”. Email “'We're preparing to give residents the best Christmas they've had in years'”. Feedback on “'We're preparing to give residents the best Christmas they've had in years'”.